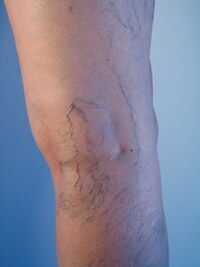 An unfortunate part of aging is the appearance of blue, purple, and red squiggly lines on our legs called spider veins. They are small, thin blood vessels visible just beneath the surface of the skin. These unattractive twisting and turning veins can be seen in shapes and forms that resemble a spider’s web. At the Center for Dermatology and Laser Surgery, we can effectively treat spider veins on the legs making them disappear with sclerotherapy. The veins are the body’s highway system to transport the blood back to the heart once its oxygen has been delivered throughout the body. The reason veins are blue in color is that the blood is deoxygenated. Veins have valves in them whose job is to prevent backflow. But as we get older those valves can fail, and the surrounding support tissues become somewhat weaker, so they don’t keep the same pressure on the veins. The result is a backup, or pooling, of blood in the vein. As the vein widens with the pooling blood, it becomes visible through the surface of the skin. Sclerotherapy was developed in the 1920s to treat spider veins, and it is still the most effective method for treating spider veins on the legs. During sclerotherapy, a sclerosing solution is injected into the targeted vein. The sclerosing solution causes the vein walls to become irritated and to close up. This makes the vein appearance vanish, or significantly diminish, and the body eventually absorbs the now-unused vein. Any blood that was running through the vein is simply re-routed to an adjacent vein. While the procedure known as sclerotherapy hasn’t changed since its inception, the sclerosing solutions have. Newer options make the process far more comfortable for the patient. Three years ago, the FDA approved Polidocanol, also known as Asclera, which has made sclerotherapy virtually painless with minimal side effects. Sclerotherapy is most useful for small, superficial red and blue veins. It isn’t recommended for larger, bulging varicose veins. Two to four sessions are typically required to fully eliminate the unsightly veins. We recommend that our patients wear compression stockings for the first few days following the procedure for the best results. At the Center for Dermatology and Laser Surgery, our providers can easily treat spider veins with great success. If you’re dealing with spider veins, we encourage you to consult with our board-certified dermatologists to learn more about sclerotherapy. Contact us at 503-297-3440 to schedule an appointment with one of our providers.